Good posture is important because when we position the body in the correct sitting and standing postures, there is even pressure on the spine, its surrounding muscles and ligaments. Having good posture can reduce physical stress on the body. Deviation from normal posture can weaken and shorten the muscles around the spine causing imbalances in the body, leading to pain and symtpoms. Poor pelvis alignment may affect your postural endurance meaning that you may be in pain when sitting or working. As part of your Chiropractic Care schedule, your posture will be reassessed and exercises may be implemented to ensure that poor posture doesn’t adversely affect your health and your life. 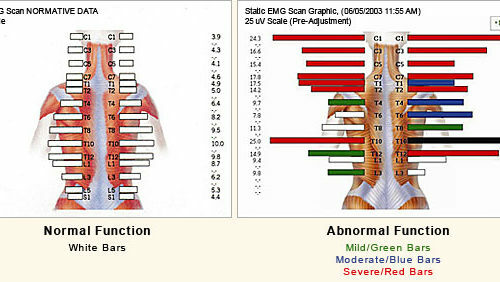 ‘sEMG’ stands for static Electromyography. It is a device that measures the amount of electrical activity your muscles release when they are contracting, more commonly known as muscle tension. sEMG is similar in function to an EcG which measure heart muscle activity. The ‘Thermal’ Element of the scanner provides us with further data regarding how spinal misalignments and muscle tension are impacting your body. The scanner also measures the symmetry of the left and right side of your body, showing us how your body has adapted to cope with your daily endeavours. The sEMG is not an invasive procedure and does not produce additional radiation. X-rays may help your Chiropractor understand the bio-mechanics of your joints to make your adjustments more precise. By assessing X-rays, we can observe the affect wear and tear has had on your joints and review any outcomes from previous physical traumas. Spinal x-rays may also provide information about possible pathology, trauma, congenital anomalies, and scoliosis. If your Chiropractor recommends X-rays, they can be done conveniently on site at either of our practices. We do not X-ray pregnant women, radiotherapy patients or children who do not present with trauma or postural deformity indicators. At The Chiropractic Domain our aim is to approach your health with accuracy and certainty, so that the service we provide is exactly what your body needs. Our digital diagnostic tools include Postural Analysis, sEMG scanning and X-rays when required.